F. Ball has launched a new, improved version of popular Styccobond F41 carpet tile tackifier. Styccobond F41 is a solvent-free, acrylic adhesive, which is designed to provide a permanently tacky film to prevent ‘loose-lay’ carpet tiles from moving laterally under normal traffic, whilst allowing individual tiles to be quickly removed and replaced if they become damaged or worn. After extensive research and development, the adhesive has been reformulated to provide improved coverage capabilities. Additional benefits include a faster drying time and increased tack – whilst still allowing carpet tiles to be lifted easily when required. 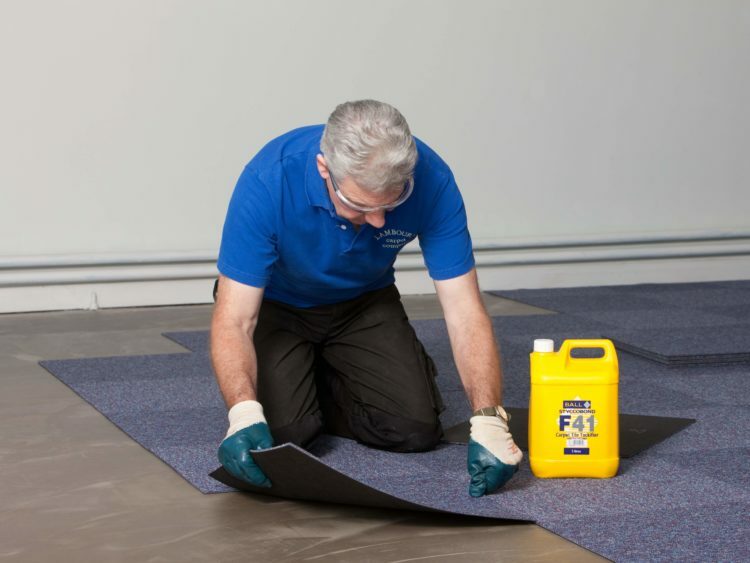 Flooring contractors will also notice that F41 is now significantly easier to apply as a result of reduced viscosity. Styccobond F41 can be used for securing a wide range of dimensionally stable ‘flat lay’ carpet tiles backed with bitumen/felt, non-woven fabric, PVC and other polymer backings. It can be applied over Stopgap levelling compounds, Stopgap waterproof surface membranes and a wide range of absorbent and non-absorbent subfloors, including structurally sound, smooth and dry concrete, sand/cement screed, plywood, raised access flooring panels and terrazzo. It is also approved for use in marine flooring installations and suitable for use over normal under floor heating systems. The product has been certified EMICODE EC1 Plus. Flooring contractors can purchase Styccobond F41 in 5L and 25L bottles as well as in a 15L rectangular bucket – for ease of application. All containers are re-sealable for future use.